This month the lovely storyteller at the Delaware Pavilion in Bexhill was an Australian and used Australian animals as props in her session. This gave us a great opportunity to theme the rest of the days activities around learning about Australia. 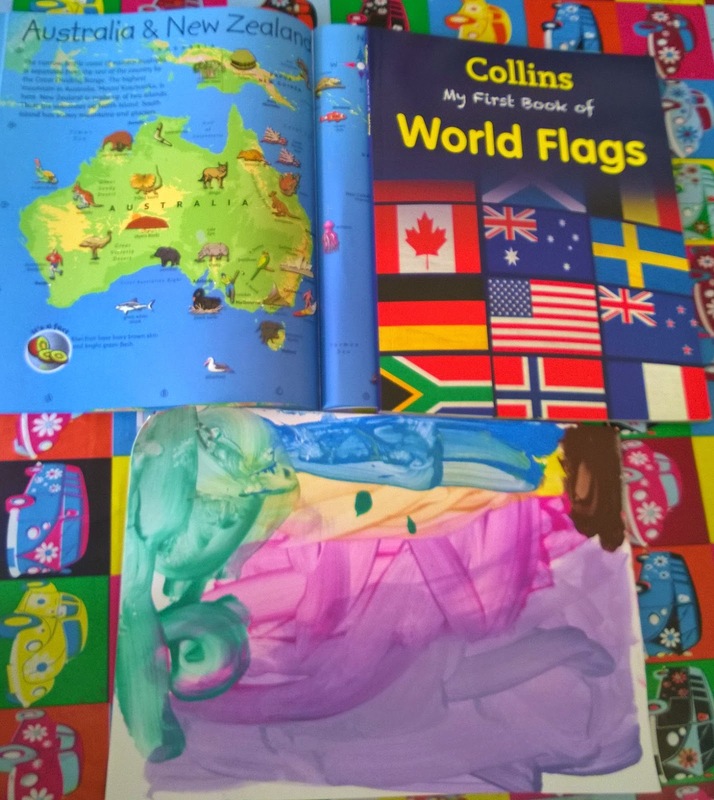 We pulled out our new Atlas and book of World Flags, both by Collins, and had fun finding the animals that had been in the storyteller's tales. There was an image of Sydney Opera House in one of the books which the boys recognised from the film Finding Nemo. Then we looked at the flag of Australia and how it was similar and different to some other flags such as the British flag and the New Zealand flag. I gave the boys the option to then either try to paint an Australian flag, or to make up one of their own. They decided to make up their own and we spent a fun afternoon making up flags and names of countries, plus where in the world our new countries would be and what they would be like. We also practiced writing the word 'flag'. We read 'A bigger digger' by Brett Avison and Craig Smith because it is based on a farm in Australia where a boy and his dog discover a dinosaur skeleton. At bedtime we finished off our themed day by reading an Australian creation story about the Sun Mother from our 'Barefoot Book of Earth Tales'. We obviously just scraped the surface of all the Australia based activities we could have done, but other things we could investigate include Australian art, food, history and much more about the wildlife. The boys certainly had a lot of fun and went to bed singing the 'g'day' song the storyteller had taught them. The benefit of having a themed day is that it makes working out activities for the day easy, and so many learning areas and skills can be covered without it feeling like you are sitting down at a lesson. We developed fine motor skills and creativity in our painting, did some writing and lots of reading together, sang, danced and learned about geography, wildlife and culture all with no more preparation than the idea that we would theme our day around whatever we found the storyteller was basing their activities on, a box of craft materials and well stocked book shelves.